Daihou-ji Temple was founded in the Nara period almost as soon as the country of Japan was formed. Over 1400 years a large number of travelers came to pay their respects to Kannon, a deity of great mercy and compassion. The Three story pagoda in Daihouji-temple is a National Treasure of Japan and is known as one of the most beautiful pagoda in Japan. Daihou-ji Temple stands in the country side in Nagano prefecture surrounded by mountains, which reveal many different views and create beautiful landscape. Daihou-ji Temple was founded during the Nara period more than 1400 years ago. 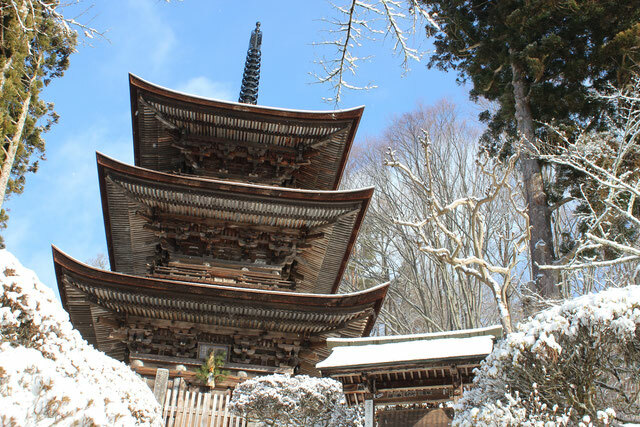 The National treasure Three Story Pgoda is one of the most beautiful pagoda in Japan. Blessed with nature Daihou-ji Temple stands in the country side in Nagano prefecture. Seasonal colors, including cherry blossoms in spring, hydrangea in summer, colored leaves in autumn, and snowscapes in winter, are always embellishing the Pagoda. Around Daihou-ji Temple there are lot of historical heritage sites such as Anrakuji-temple and many hot springs. You can enjoy the unique atmosphere of local Japan.